We grab a coffee with IBMers from around the world, and share our chat in this weekly spotlight series. 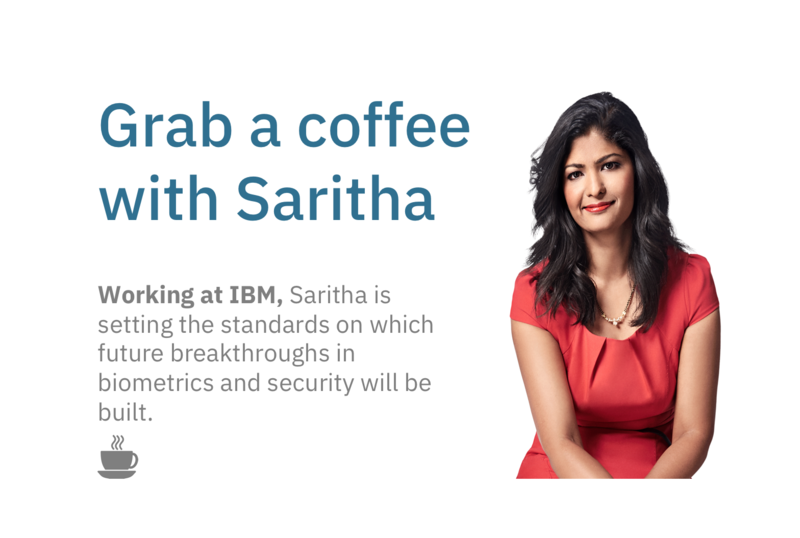 This week you can meet Saritha, from IBM UK. In celebration of International Women’s Day, Saritha shares her thoughts about women’s progress, and what it means to be a woman at IBM. currently Leading the security architecture and delivery of a massively complex Blockchain project for 10 major European Banks. that I work in Security as working in security is absolutely cool !!! is to fit all the things I am doing within the day and keeping myself up to date with the changing world. my journey in IBM for the last 15 years has been amazing. One of the most memorable moments in my career has definitely been when I got chosen to work as the Lead Security Architect on this complex enterprise Security Project that is going to make a big impact to IBM once we go live. be passionate about your work and always think about career progression and fill in the gaps to make it possible. Keep your goals up to date, have as many mentors as you like. Do seek help and guidance from people who are experienced. IBM is a large company and there are so many people who will be willing to help. So don’t hesitate to reach out. What does women’s progress mean for you? It does mean a lot to me. I am passionate about helping women who want to progress in their technical career. I do mentor a lot of women and help them progress. I also help with other “women in tech initiatives” including getting more women to work on patents, talks at Universities and schools highlighting the importance of STEM subjects in Industry. How have you experienced progress for women in IBM? IBM gives equal opportunities to all who want to progress. We have a number of diversity initiatives helping women progress. I have contributed in programs like “Developing your technical career” by mentoring the groups of women that attended the program. I also contributed by talking about my journey the lessons I learnt along the way.